If you would like to be added to our Newsletter mailing list, please go HERE. A limit of one online entry per day is allowed per salon location and per e-mail address for each separate promotion unless otherwise specified. Subsequent entries determined to be submitted from the same email address/salon or from the same individual using multiple email addresses in violation of this rule will be declared ineligible. All entries received by 11:59 P.M., ET, 10/30/19 will be eligible for our grand prize of $25,000.00 (USD) or choice of designated prizes shown. VW car, pair of jet skis, or a high-end tanning bed. Contestants from Alaska, Hawaii, and Canada must accept the $25,000 cash prize due to elevated product pricing in those areas and added shipping cost of physical prize. 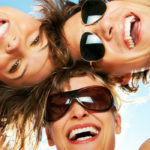 Twilight Teeth will give away one (1) of the prizes shown on our website or the equivalent $25,000.00 (USD) grand prize. NO PURCHASE OR PAYMENT IS EVER NECESSARY TO ENTER TO WIN! Prizes will be paid as follows: If a salon owner is chosen from this Promotion, the winner will receive only one of the prizes shown. The prize will be of their choice after they have been verified eligible to win. you will receive $25,000.00 (USD) if you live in Canada , Alaska, or Hawaii. By entering this promotion, each entrant accepts and agrees to be bound by these official rules and the decisions of Twilight Teeth . Twilight Teeth is not responsible for any incorrect or inaccurate information, whether caused by website users or by any of the equipment or programming associated with or utilized in the Sweepstakes or by any technical or human error which may occur in the processing of submissions in the Sweepstakes. Twilight Teeth Inc. assumes no responsibility for any error, omission, interruption, deletion, defect, delay in operation or transmission, communications line failure, theft or destruction or unauthorized access to, or alteration of entries. Twilight Teeth is not responsible for any problems or technical malfunction of any telephone network or lines, computer systems, servers or providers, computer equipment or software on account of technical problems or traffic congestion on the Internet or combination thereof, including injury or damage to participants or to any other person’s computer related to or resulting from participating or downloading materials in this Sweepstakes. If, for any reason, the Sweepstakes is not capable of running as planned, including infection by computer virus, bugs, tampering, unauthorized intervention, fraud, technical failures, or any other causes beyond the control of Twilight Teeth Inc. which corrupts or affects the administration, security, fairness, integrity or proper conduct of this Sweepstakes, Twilight Teeth Inc. reserves the right to terminate the online portion of the promotion. Entries become the property of Twilight Teeth Inc. and will not be returned. Twilight Teeth Inc. reserves the right to disqualify any entry determined to be ineligible to win or any violation of the spirit of the official rules. 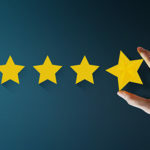 Any use of programmed, automatic or scripted entry methods will void all associated entries and individuals using such methods may be disqualified for future entry opportunity. Each entry must be made by salon owners or staff manually. Write-In Entry Instructions. You may write in as often as you like to enter our contest with address below. eligibility will be based on date the write-in entry is received and the numbers of entrees Twilight Teeth actually receives before the last closing date of the give-away. Just mail each entry separately. We do not accept entries from a third party or entries sent in bulk. ONE PRIZE IS GUARANTEED TO BE AWARDED AS OFFERED. BUYING WON’T HELP YOU WIN. Prize Value: Giveaway ALL PRIZES ARE OF EQUAL VALUE. WINNER MUST CHOOSE THE PRIZE FROM ONE OF THE 4 OPTIONS AVAILABLE. 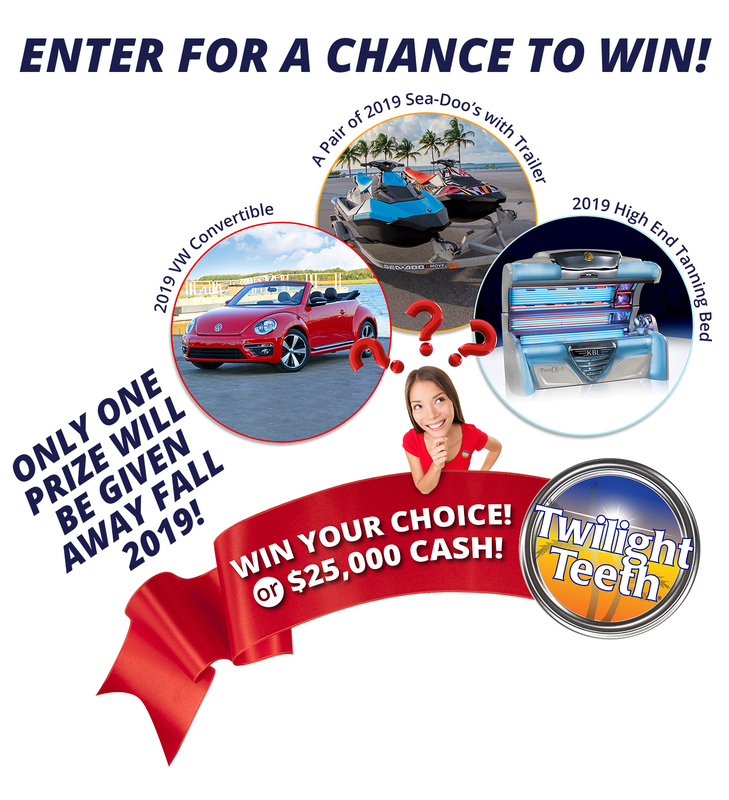 Twilight Teeth will then purchase the winner’s choice or issue a cash value check for the $25,000.00 (USD) within 45 days of contest end. The winner is responsible for all sales tax, registration, title , etc. and all fees associated with the prize other than the cost of the prize itself limited to $25,000.00 (USD). * Winner may be determined earlier. All Entries Have The Same Chance Of Winning. Enter as often as you like. You don’t have to wait for us to email you an entry opportunity. You may submit additional entries online or by writing to us the address above. Each time you write to us you will be entered once into each ongoing sweepstakes. Each entry request must be mailed separately. You will be registered to win with every order of Twilight Teeth from your distributor of your choice upon asking.